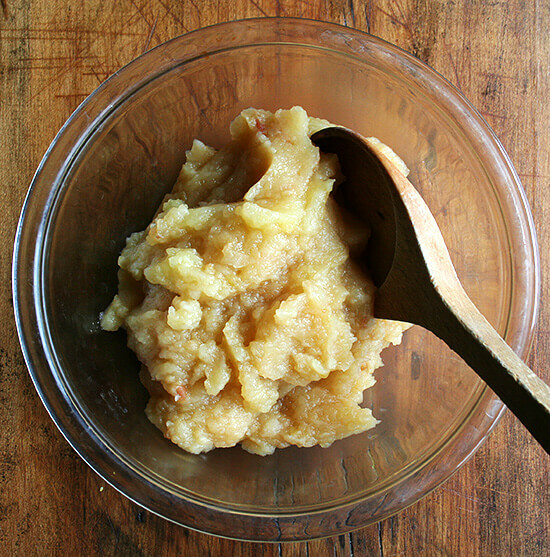 You all know it takes no time to whip up homemade applesauce, right? And you know how good it is, too, right? Just a quick little post here to make sure. I’ve been enlisted to make applesauce for this Thanksgiving so I’ve been practicing. Oh, there is one stipulation. You sort of need one of these, a Foley food mill. They’re cheap, which is good, because it will likely sit in your cupboard for 10 months out of the year. I only use mine to make applesauce. Am I missing something? Are there other recipes out there requiring a food mill? If you know of any, please share. Also, I’m afraid my mother would be deeply disappointed if I didn’t mention one thing: Apples top the “Dirty Dozen” list. And apparently, scrubbing and peeling doesn’t eliminate chemical residue completely, and you definitely want to keep the skins on when you make applesauce — that’s where all the flavor lives. So with apples, it is ideal if you can purchase organic or if you can purchase from your local-but-perhaps-not-certified-organic-though-organic-in-every-sense-of-the-word apple farmer. Make sense? *Any variety of apples will do, but I have been partial to Fuji and Lady Pink, because I can get those varieties at my farmers’ market. So, there isn’t really a recipe here, just a method. 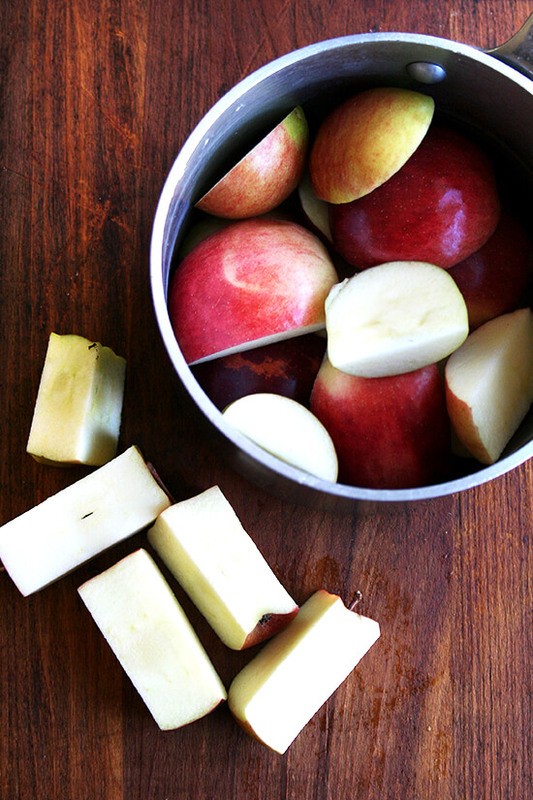 Cut apples into big chunks — cut straight down around the core and discard it. Place them in a large pot with about a cup of water. Cover the pot, bring it to a boil, reduce the heat to medium, and simmer until the apples are very tender, about 20 minutes. This can take more or less time depending on the variety of apples you’ve chosen to use and the number of apples you have jammed in the pot. After you make this once or twice, you will have a better sense of the water-to-apple ratio. 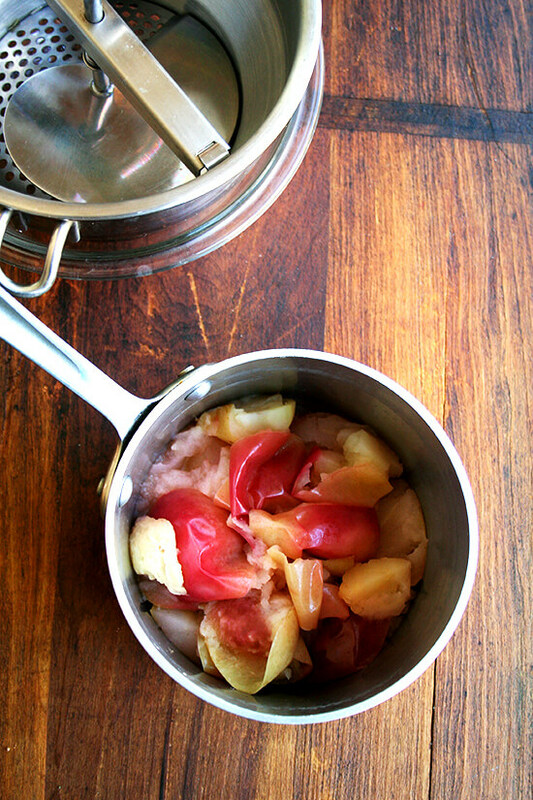 Once the apples are tender, spoon them into the food mill in smallish batches. Start cranking. You may or may not need all of the liquid remaining in the pot. That’s it. You’re done! 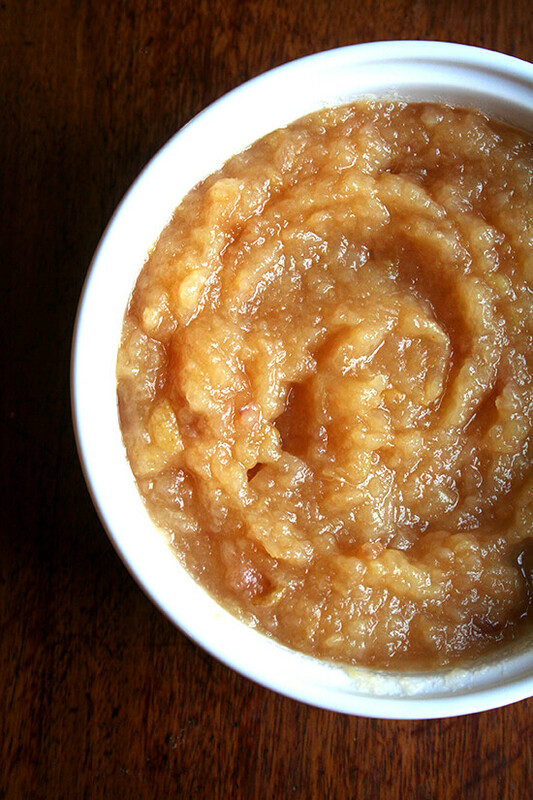 we made applesauce about a month ago – the best way to deal with the “my eyes were too big for my stomach when we went apple picking” conundrum. 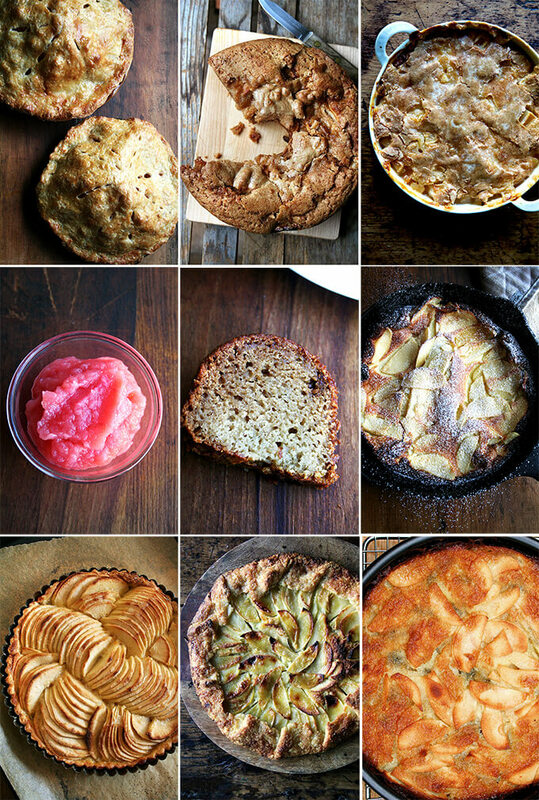 a great way to use up tons of apples. 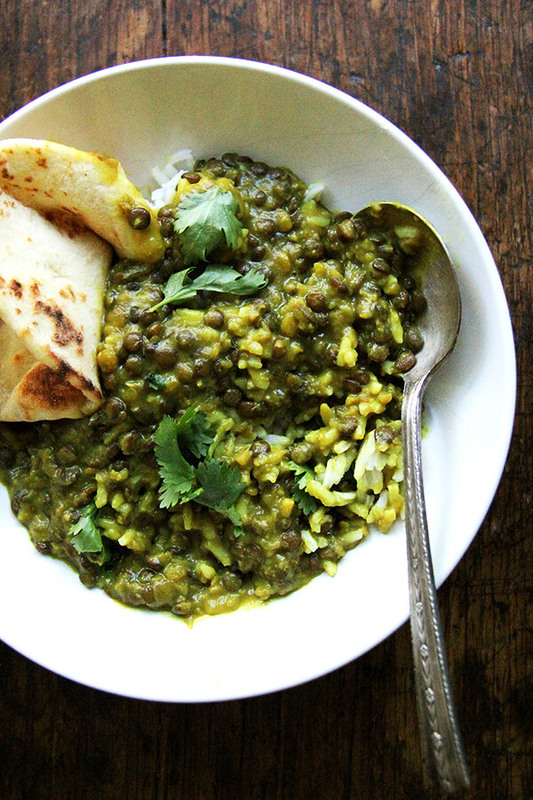 this recipe looks great – i’ll try it next time. I use my food mill for split pea soup. Leaving the skins on there makes this super fast and easy. Had no idea you could do that! I work at a garden with over 150 varieties of apple trees. All season I’ve been taken a mixture of apples and baking them, skin on, with cinnamon, then pureeing them in a Vitamix. 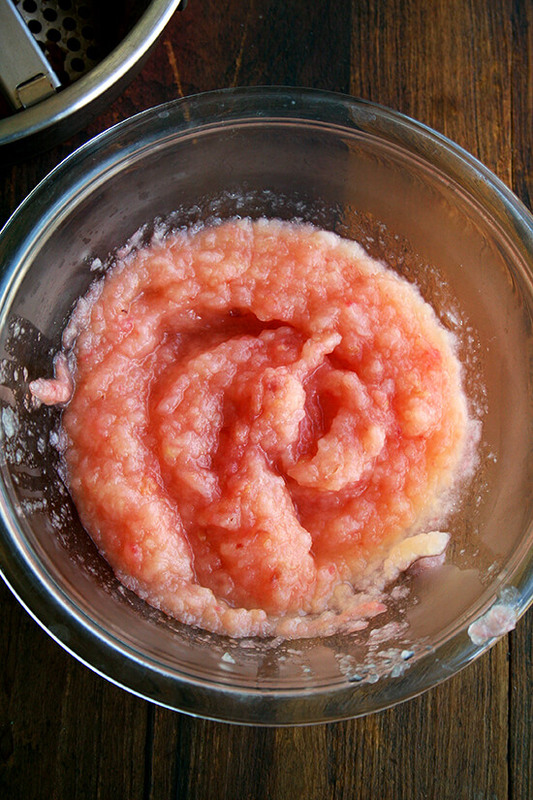 Lazy girl’s applesauce but it’s just as tasty as I imagine this recipe would be! I have been trying to come up with another excuse to buy a food mill and I’m sold! 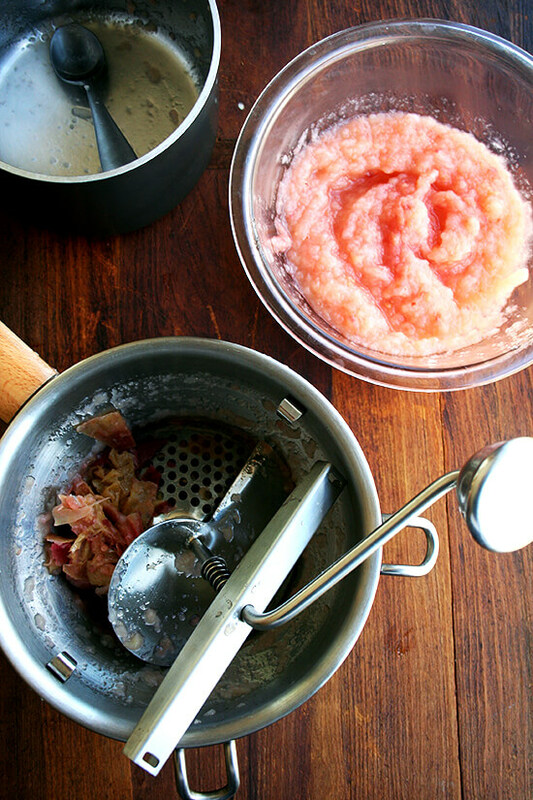 This method of making applesauce looks awesome. is there an option for making this without a food mill? I have a food mill almost identical to this one, by Oxo Good Grips that I purchased at Bed, Bath & Beyond. It was inexpensive and I use it ALL the time! I use mine mostly for making mashed potatoes. 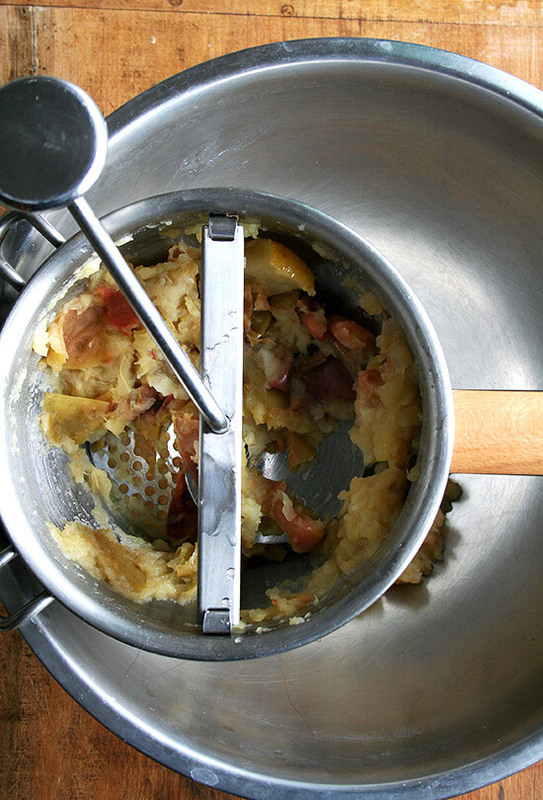 I read about using food mills for mashed potatoes in the Cook’s Illustrated, America’s Test Kitchen magazine. It is amazing and creates perfectly smooth mashed potatoes. 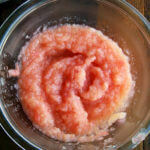 Molly — great tips on the food mill! I need to branch out…seriously apple sauce is its only job at the moment. Will definitely try with mashed potatoes. Hi Molly. I was wondering if a person uses “ugly apples” to make apple sauce if it is ok to leave the skins on. Is then any risk to human health. I’ve looked on the internet and can’t find an answer to my question. Thanks. Hi Maxine, Gosh, I’m not really sure, but my gut is that there would be no risk. I would guess that the apples get hot enough to kill anything harmful. 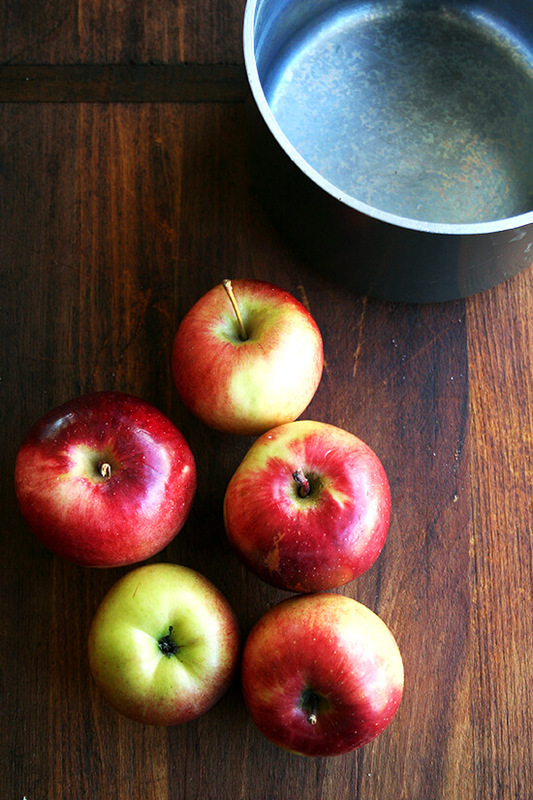 Made this recipe the other day with organic Gala apples (sale price .99/2# bag!). Great results! 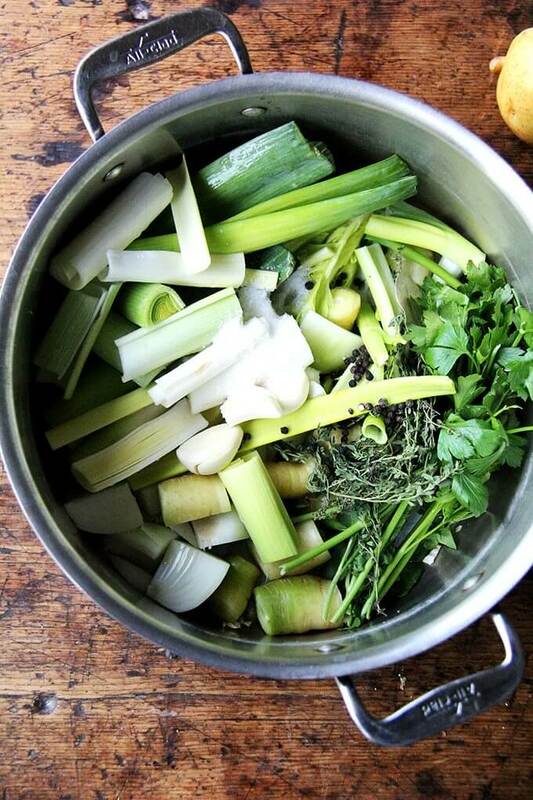 So nice to have a sugar-free recipe. I tossed the cores in too (minus the stems) for the pectin, then removed before using the food mill. Perfect healthy snack for grandkids. Planning to make more for Thanksgiving! Wonderdul to hear this, Kathy!